Let’s Treat All Cars Like School Buses: Drive Safe! According to the National Highway Traffic Safety Administration, “Fatalities per 100 million Vehicle Miles Traveled” has been trending down since 2005. In 2005, there were 1.46 fatalities per 100 million vehicle miles traveled. This means that for every 100 million miles traveled by car in the United States, there were 1.46 fatalities. That may sound like a rather low number, but consider that since this particular statistic has been kept, the highest this number has ever been was back in the first year it was kept, 1994, when the number was 1.73. In the years following 2005’s number of 1.46, we’ve seen the number go to 1.42 in 2006, to 1.36 in 2007, to 1.26 in 2008, and to 1.13 in 2009 (numbers for 2010 were not reported as of the writing of this post). Looking merely at the statistics, this number seems to be trending downwards more than in any other 5-year period since 1994. While on the face of the statistical trend, it’s great, but really, should this number be above zero? As I was driving home the other day, I saw a school bus van. Immediately, even before I could read ‘school bus’ on the side of the van, I was able to recognize the color of the van and know that it must have been a school bus. Typically, when I see a school bus, I tend to slow down (even a little bit). I would guess that the fair majority of the population would do the same. Why do we do this? Well, in part, because it’s the law. More than that, I slow down when I see a school bus because usually, there are kids on-board, and who wants to cause an accident that harms children? As a nation, and maybe a species in general, we tend to look more favorably upon our young. That is, when faced with a moral dilemma upon saving people, we almost always save the child over ourselves (or other older people in the group). There are many different theories as to why this is, but I won’t get into them. I’m more interested in our behavior in the car around school vehicles. We slow down when we see school vehicles, but why don’t we slow down when we see other vehicles? 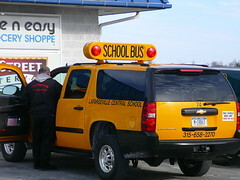 Shouldn’t we drive with the same care and caution, all the time, that we do when we see a school vehicle? When we see a school vehicle, something about the vehicle stands out (usually that school bus yellow), and we immediately are more cautious with our driving. I think we should be just as cautious around other cars as we are around school buses. 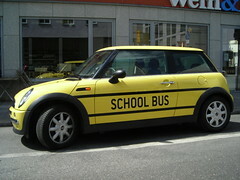 What if all cars were painted the same color as school buses? Do you think we’d be just as cautious around other cars as we are around school buses? My guess is that the attention-grabbing feature of the color would soon fade as we all became accustomed to seeing that color on every car. But shouldn’t we still drive as if every car is a school bus? Every car on the road carries “precious cargo” — another human being. All life, old, young, middle-aged — is precious. All life is worth preserving and caring for. There needn’t be any fatalities when one is trying to go from point A to point B. It’s just unnecessary. 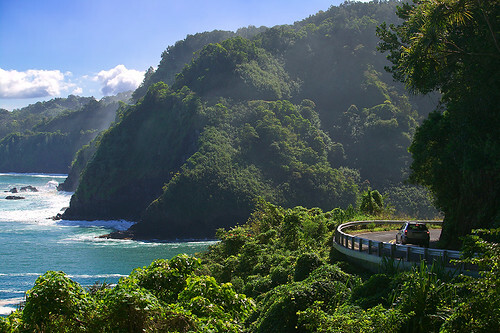 Wouldn’t you want someone who makes a turn down a windy country road, who sees the light blue color of your car to slow down a little, because you’re approaching from the other direction? I certainly would. This entry was posted in Health and tagged Children, Driving, Human, Life, School Bus, Vehicle. Bookmark the permalink.